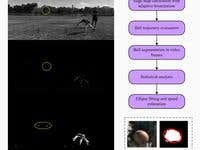 We have developed the algorithm for the fast moving object tracking. The methods allows to successfully detect the object, automatically extract the key frames, perform the segmenation of the ball and fit the ellipse in the min-least-quares manner. The algorithm can be applied in real-time. I'm working in field of signal and image processing. My relevant skills include various signal processing and analysis techniques, computer vision and machine learning, artificial intelligence and pattern recognition and many more. My main instruments include but are not limited to: - C/C++/C# - OpenCV - Matlab,R I have successfully received a PhD in Physics and Mathematics and I am actively involved in scientific research. Currently, I have more than 30 publications and dozen of reports at international conferences all over the world. More information can be found in my website ([login to view URL]) My aim is to provide a high-quality solutions of problems of different scale and complexity. I'm always interested in new work and open for the discussion. I have successfully built one of the strongest profiles in Freelancer and created a team of enthusiasts, who are working with me.